I am devoting this week's log to the subject of sowing bulb seed and in particular the depth at which you should sow the seed, to get the best and quickest results. I started experimenting with the depth of sowing seed after trying to figure out why the self sown narcissus in the bulb house sand plunge always grew better and flowered quicker than the ones that I had carefully sown in pots in the conventional way. It took me a while to realise that there were two lessons to be learned from this observation. The first was the way that the seed was stored which I will discuss in a future log and the second was how to sow the seed. When the narcissus seed was ripe I did not always collect it in time and it was shed onto the sand plunge, as I removed the pots for repotting and then replaced them I disturbed the sand enough for the seed to get buried sometimes at the bottom of the plunge and so my experimenting began. I started sowing several pots of the same seed at different depths, which I indicated by a mark on the plant label, and I carefully watched the results. Above are the one year old seedlings from the deepest sowing that I made, they are significantly bigger and healthier than the surface sown ones. Narcissus bulbs are one of the many bulbs that can pull themselves down into the ground. 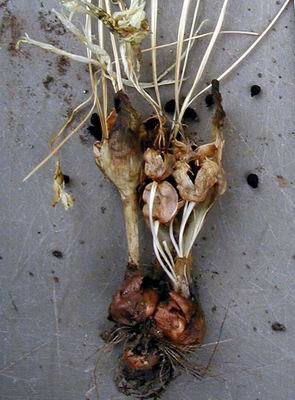 This can be seen clearly from the picture above where the bulbs on the left have a fat (contractile) root as well as the normal roots, as the plant goes dormant this fat root contracts as it dries out, pulling the bulb down. The lower right hand view shows bulbs that have been at the correct planting depth and above are the elongated bulbs trying to take themselves deeper. The seed will germinate if surface sown and the bulb will gradually take itself down until it achieves its optimum planting depth some three years later. 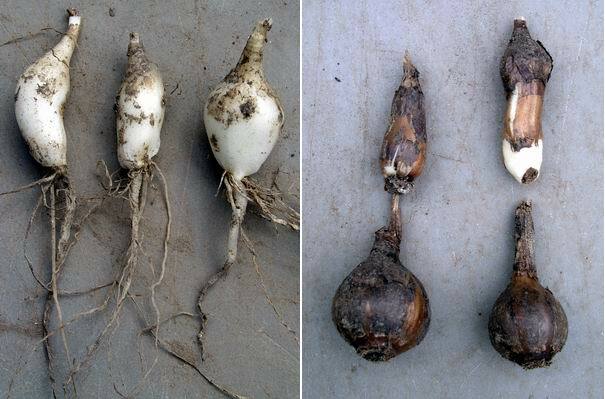 Here we can see this progression over a few growing seasons where the bulbs have moved gradually down over three growing seasons; the ones bent through 90 degrees have hit the bottom of the pot. So my next question was how does the seed achieve depth in the wild when it is shed by simply falling out of the opening or disintegrating capsule? 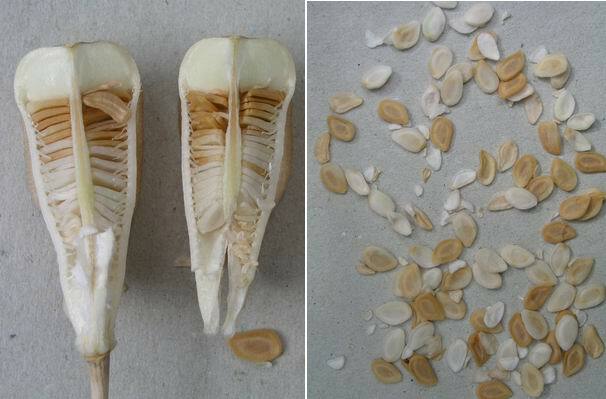 The answer can be seen if you study the seed carefully - you can see a small, usually white, appendage attached to each seed. These are mostly sticky and attractive to insects, especially ants, which are the vehicle that takes the seed underground. This led me on to studying the seed of other the other bulbs we grow. 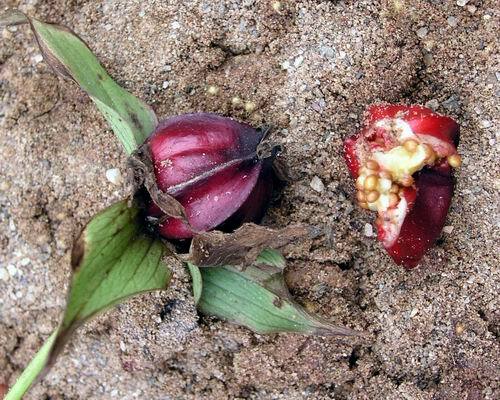 The seeds of many bulbs have a tasty treat to attract ants or other insects, this serves two functions. 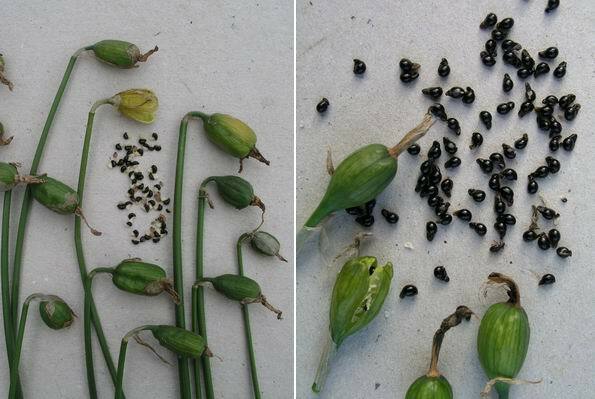 One: it disperses the seed so they are not all having to grow congested where they fall at the base of the parent plant, two: the insects usually bury the seed. 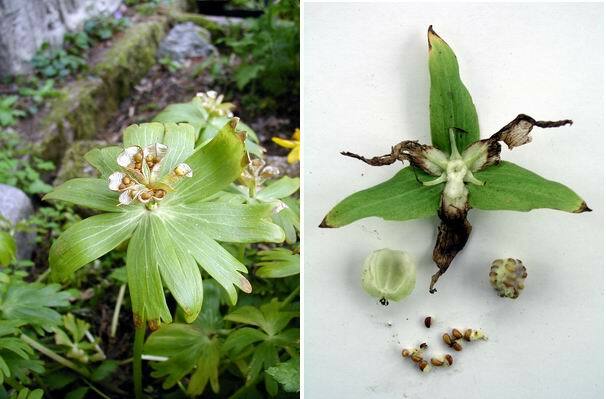 This leads to another problem for us in the garden as some trillium seed, like T. ovatum, has such an attraction to wasps that they often break into the capsule and take the seed before we can collect it. Here you can see an early experiment where I have sown these trillium seeds a cautious 2cms deep, where they are growing quite well - I now have the confidence to sow them at around 5cms deep. 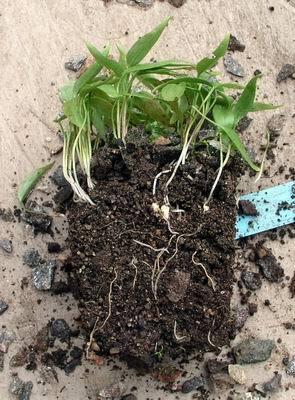 If you think how vulnerable a young seedling bulb is and if all that covers it is a thin layer of gravel then it is going to be subjected to big swings in moisture level, temperature variation and it is also much more likely to be eaten or infected with mould and fungal problems. Crocus are another group that do best if planted deep and again we can start to see the link between how the seed is dispersed in the wild and what depth we should be planting the seed at. Many crocus also have the sticky appendage attached to the seed and there are some crocus seed pods that do not come above ground, certainly in cultivation, even when they are ripe and open. The top tip of these seed capsules was just at the gravel top dressing. As I look at more of the bulbs we grow I am now starting to be able to predict whether it is best to surface sow the seed or sow at depth. 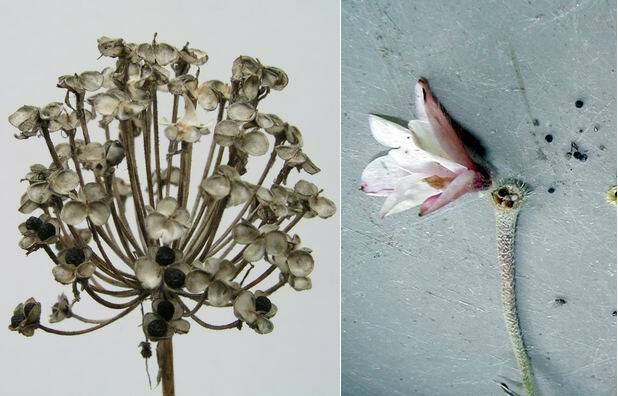 On the left is a typical allium seed head, which you will observe, hangs onto the seed for a long time even after it has opened unless it gets broken off by the wind and then it gets blown around, tumbleweed style, shedding some seed each time it is knocked. 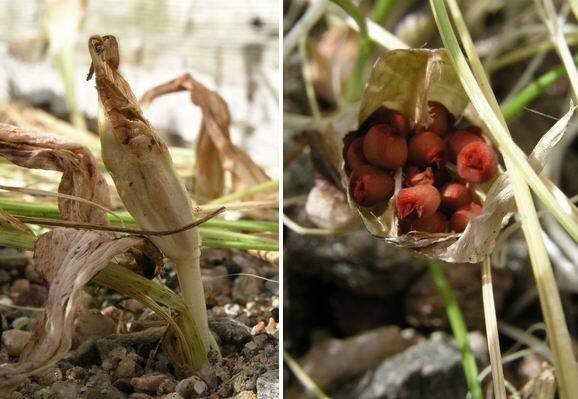 On the right the Rhodohypoxis seed just seems to fall to the ground and I have not worked out how else it might get dispersed. 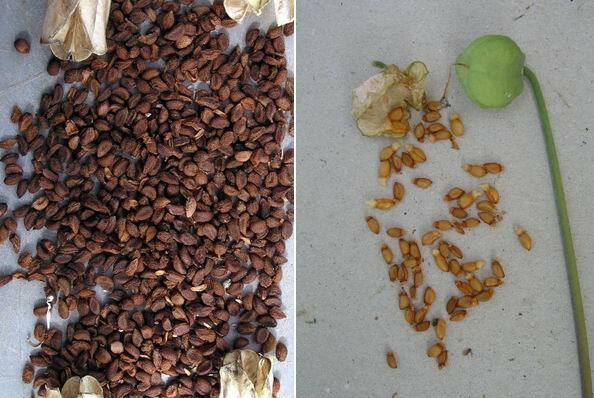 Fritillaria seed is obviously wind dispersed; the thin papery seeds can be blown a considerable distance as they are slowly released layer by layer from the stacked seed pod. Fritillaria seed will not germinate if sown deeply, they have to be surface sown and only covered by a layer of gravel - it may be that they also require light to stimulate germination. 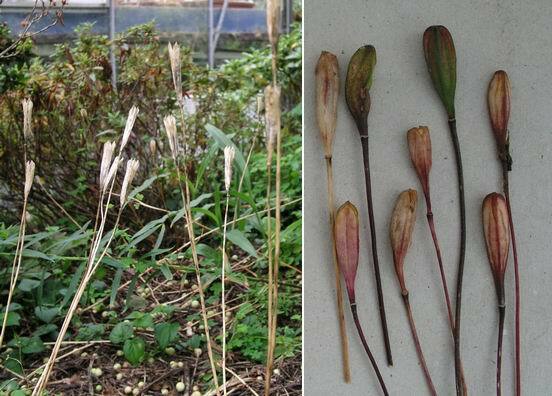 I have never germinated any of this papery type of seed, which also includes lilies, which I have sown at depth. 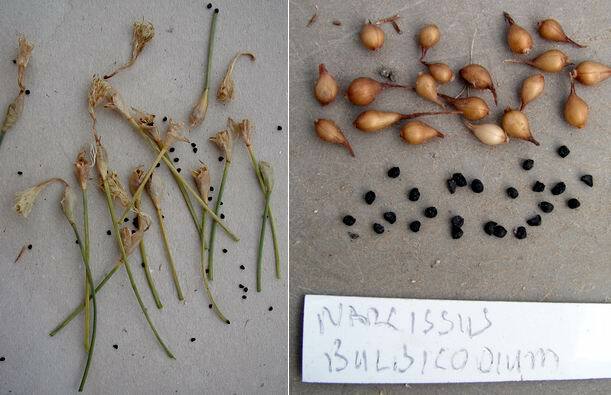 There is a fundamental difference in the way that Narcissus seed and Fritillaria seed germinate. With Narcissus the seedling bulb forms beside the seed so if the seed is surface sown the young bulb spends its first year on the surface before it starts to take itself down. 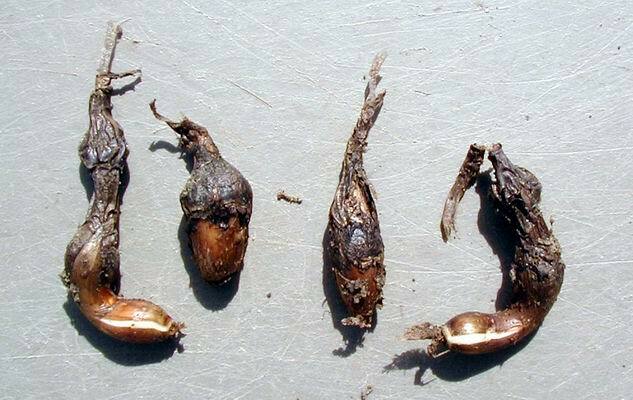 The fritillaria seed sends a root down into the ground and the young bulb forms at the end of this root so it is safely at a good depth from the very start. I am still experimenting with many other bulb seeds to see how they behave. My initial thoughts on Erythronium were that it would be best sown at depth, based on the assumption of how deep the bulbs take themselves in the garden, but my initial experiments have shown that this is not the case. 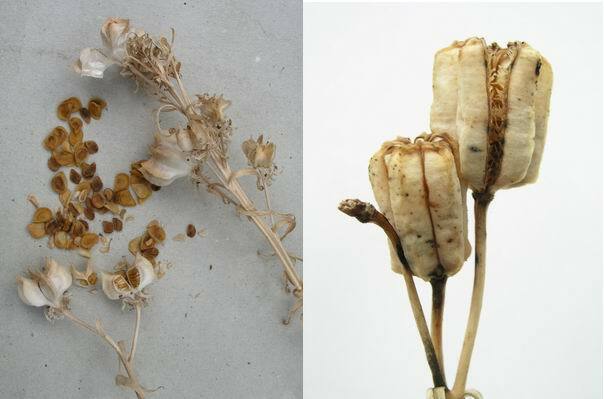 If I apply my own theory and look at how the seed is dispersed, by wind and the 'catapult' type action of the dried stem and open seed capsule, then I should have guessed it should be surface sown. I have an on going extensive experiment into erythronium germination and seed development which I will also report on at a later date. which has a significant attachment which may attract ants and so my experiments will continue. As a quick rule I can tell you that Narcissus, Crocus, Cyclamen, Trillium and Tecophilaea all do best if the seeds are sown deeply and Fritillaria, Lily and Tulip seed need surface sowing. If in doubt sow on the surface as nature has made sure that while some seeds will perform best when sown deeply they will also germinate and grow if shed on the surface.